Especially today, the joke might also remind one of the artifice of nation-states, with their multicultural makeup patched together symbolically under the banner of a flag. It doesn’t seem coincidental then that sports hooliganism is often coloured by nationalism, as in the Irish fans of Hibernian F.C. and Scottish fans of Heart F.C. treating soccer as an excuse to square sectarian disputes. Sports, as in international relations, are often about in-groups and out-groups, organized along almost arbitrary geographical lines, duking it out for supremacy. Still, rare and unlucky is the person who hasn’t at some point lost themselves in a crowd loudly overjoyed about the gladiatorial triumph of their favourite sports team. It’s a thrill I’m sure that many of those in the more ‘civilized’ business of entertainment known as the arts wish they could replicate, at least in intensity. 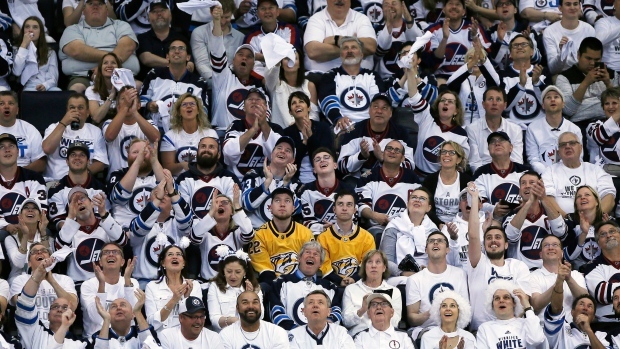 When I attend Winnipeg Jets games I can’t help but take note, with as much admiration as disbelief, of the impeccably choreographed show of merchandising and “Go Jets Go!”-ing, smoke and mirrors, that helps to conjure an almost mystical experience of togetherness. When I stare out at the sea of fans in overpriced white jerseys shouting “True North” during the national anthem, I catch myself thinking snobbily about consumerism and jingoism. But I also think about our diverse, often divided, city coming together in a precious spirit of solidarity and community. It has become commonplace to associate ‘togetherness’ based on place with one kind of chauvinism or another, but sports mania at its most wholesome is not the only positive outlet for such feelings. If there was anything redemptive about the devastating 1997 Red River Flood, the “flood of the century,” it was the movement of thousands of volunteers to assist their civic neighbours with sandbagging and evacuation. Without at least a moderate sense of community and common interests traversing Canada and transcending its divisions of class and culture, it’s doubtful that Canada’s universal healthcare system would survive. Canadians, looking askance at the United States, feel no shame in touting the comparative virtues of their healthcare system, but they are perhaps more hesitant about expressing pride in their country’s artistic and cultural achievements. This isn’t only out of modesty or stereotypically Canadian politeness. It’s also out of deference to Canada’s culture of multiculturalism, a national tradition wary of national traditions. This is sometimes felt to discourage big acclamations about the music, painting, fashion, or dance of one cultural group for fearing of appearing to slight another. There’s clearly still much work yet to be done to realize the goals of multiculturalism, both in the arts and outside. But this shouldn’t stop us from taking pride when the diverse inhabitants of Canada create beautiful, fascinating things, perhaps even more so when they hint at progress in this direction. Among the beautiful, fascinating things made in Canada on my mind recently is the program that we’re experiencing tonight, written and performed by the world-famous Tafelmusik, about all of the ordinary people, the violin carvers, papermakers, and artisans, who surrounded Bach and made his music possible. I’ve also been relishing gorgeous midi excerpts of Kevin Lau’s Writ in Water, which the MCO commissioned and performs at our 19 March matinee and evening concerts. A prominent young Canadian composer of classical music, Kevin is also the type unafraid to take to YouTube to perform mash-ups of popular music. Lau’s obvious sense of levity appears tastefully in his work with forms otherwise not especially known today for their lightness—concerti, ballet, opera. There’s joyfulness in Writ in Water, although, from what I’ve heard, it’s contrasted with elements more often seen as markers of musical ‘seriousness’, like tone clusters and references to Romantic poetry. Our March concerts also feature a double violin concerto by the JUNO-nominated Vivian Fung. I haven’t heard excerpts from it, and am eager to, but am told it borrows from Balinese Gamalan, one of my favourite discoveries in world music. It will also be exciting to hear Karl Stobbe, the MCO’s esteemed Concertmaster—who London’s Sunday Times calls “a master soloist, recalling the golden age of violin playing”—perform one of the piece’s solos. Our March show, which tours eastern Canada after our Winnipeg concerts, will be a tour de force shining a spotlight directly on the celebrated musicians who work closely with the MCO. So, while it’s such a treat to see Tafelmusik perform tonight, why not also come out and support the home-team in March?